THE STAPLE SINGERS are playing in my head today. I think it’s easy to tell they started out as a gospel group, but then had a bunch of good secular tunes later that turned into big hits, and always carried a positive message! Pops Staples started it all, with his kids, the most well-known of whom is Mavis, who sang lead. The actual last name was Staples, but they used “Staple” with no “s” for the name of the group. Pop and his kids started out singing in church, of course, but appeared at various churches all over the Chicago area, and had a recording contract early on…with songs like “Uncloudy Day,” and “Will The Circle Be Unbroken.” Bob Dylan once said that The Staple Singers’ harmonies, and especially, the strong voice of Mavis was a big influence on him. 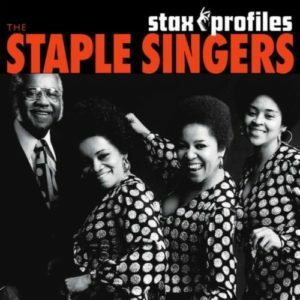 In the late 60’s The Staple Singers signed with STAX Records out of Memphis, Tennessee, and that’s when their recording career really took off! They started doing tunes that were appealing to a more mainstream audience, but they always maintained that deep gospel sound, although, over time, they moved in a more funky and soulful direction. In 1971, the hits started coming! They had recorded a couple of albums down in Muscle Shoals, Alabama, including “Heavy Makes You Happy,” which was their first big hit. Remember, “Sha-Na-Boom-Boom-Yeah?” That’s the song. And then late in ’71. “Respect Yourself” came out. Huge hit. It went all the way to #2 in the nation. There were other popular songs during that time period, too, and the song that’s in my head today came out in 1972. “I’ll Take You There” went all the way to #1 in the country! The Staple Singers have had a great number of collaborations with other artists, too. For example, performing on “The Weight” with The Band. The Staple Singers had recorded that number themselves several years earlier! 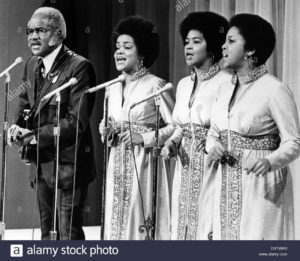 There are too many examples to list, but The Staple Singers have had such a great influence on the music scene that they’re in the Rock and Roll Hall of Fame since 1999. Pops Staples died in 2000, and his oldest daughter, Cleotha has passed away, as well as Yvonne, who just died last year, but Mavis has carried on the family tradition on stage… singing with others, and pursuing her own solo career. She’s one of the most respected performers in the business!